Built-in, rechargeable battery gives up to 9 hours of portable use. The Raiden RPM-100 portable mixer is designed to elevate your portable scratch and mix experience. This ultra-compact 2-channel DJ mixer is a perfect hybrid. Its onboard rechargeable battery delivers up to nine hours of portable use. 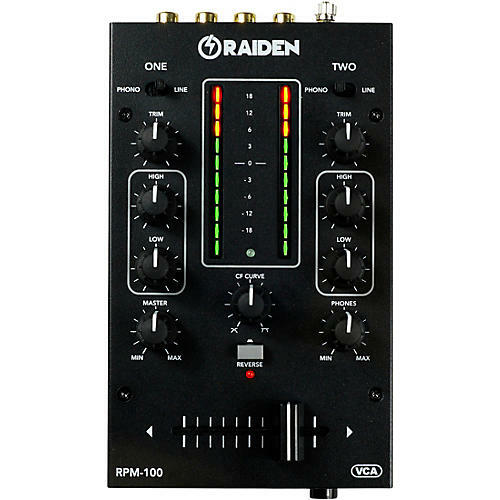 Not only is it great for portable turntablism, the Raiden RPM-100 DJ mixer is ideal for studio use. The Raiden RPM-100 battery-powered compact mixer is equipped with an Innofader Mini Plus crossfader. It’s fully adjustable and offers three internal curve settings. This ultra-portable 2-channel DJ mixer is VCA-controlled for reliability and noise-free audio. The RPM-100 features RCA line and phono inputs with ground posts for connecting professional DJ turntables such as the Technics SL-1200MK7 or Pioneer PLX-1000. Each channel on the RPM-1000 portable DJ mixer has dual-band EQ and an LED VU meter. Take your portable turntablism to the next level—order today.